Harrogate Town travel to Solihull Moors on Tuesday evening aiming to turn up the heat on the National League's top two. 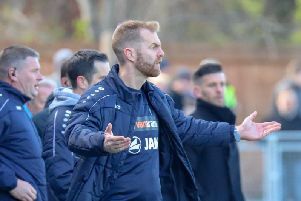 Simon Weaver's men currently sit third in the table following Saturday's success at Maidenhead, and a second victory in the space of four days would leave them just four points shy of leaders Leyton Orient and three behind Salford City. "Back-to-back wins are hard to come by in a division as tough as this and it would be massive for us if we could follow up Saturday's result with another victory," Town skipper Josh Falkingham said. "Solihull are in really good form and are right up there. Beating the teams around you in the table doesn't just leave you in a better position, it sends out a real statement as well. "We're happy with where we are in the league at the moment but we're desperate to get another positive result and close that gap at the top. "We've had three tough away games in the space of a week and if we could end that period with six points from nine then we'll have done really well." Town triumphed 3-1 when they hosted Solihull at the CNG Stadium back in August, yet Falkingham is expecting a tougher test this time around. "I'm certain that they will be a different kettle of fish," he added. "They're on a great run at the moment and they'll take a lot of confidence from having taken Blackpool to a replay in the FA Cup the other night. "They're a big powerful team and they will be even more of a force to be reckoned with this time. We'll have to raise our game and match them on the night. "If we can do that, apply ourselves and get the ball down and play then we know we can come away with a result." Tim Flowers' Moors currently sit sixth in the National League standings and are unbeaten in nine matches in all competitions. Their 0-0 draw with League One Blackpool in Friday's FA Cup second round clash saw their mean defence keep a clean-sheet for the the sixth successive game. Adi Yussuf - who netted against Town the last time the teams met - and Daniel Wright lead the Solihull scoring charts, both men having netted eight times so far this season. Kick-off at Damson Park on Tuesday is at 7.45pm. For live updates and post-match reaction follow @HarrogateSport on Twitter.